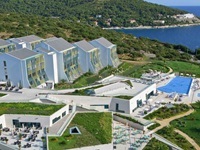 Valamar Collection Dubrovnik President Hotel is a hotel located on the tip of Babin Kuk peninsula, 3 km from Old Town. This hotel has been recently upgraded to 5-star hotel. Located directly on the beach, this hotel offers magnificent views over the Adriatic sea and the Elaphite islands. Valamar President is ideal for families with children, couples and those who want to enjoy more active holiday. 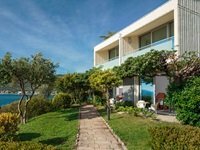 Valamar Collection Dubrovnik President Hotel offers accommodation in 180 spacious, comfortably furnished rooms. Each room has a balcony or terrace with magnificent sea views. Room amenities include en-suite bathrooms, satellite TV, mini bar, safety deposit box, hair dryer, bathrobes and slippers, direct dial phone, DVD player and wireless Internet access (surcharge). The show-cooking, fully air-conditioned hotel restaurant serves international and Croatian cuisine (for breakfast and dinner). Lunch is available at Elafiti restaurant. There is an aperitif bar with outdoor terrace. The hotel also offers a cafeteria by the pool and restaurant by the beach serving cold and warm snacks, fish and meat dishes, salads, desserts and a wide selection of drinks. A panoramic lift takes you to the stone-paved and pebble Blue Flag beach. This beach is one of the most attractive beaches in Dubrovnik. Public showers and changing rooms are available for use. Guests of the hotel can use deck-chairs and parasols. 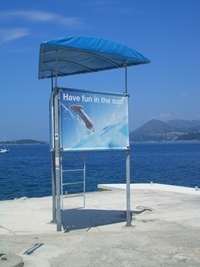 The wide choice of summer activities is available at the beach (banana boats, padle boats, water-skiing, canoeing, diving). From the hotel you can easily walk to the nearby Cava beach, set in the beautiful natural surrounding and Coral Beach Club with a range of amenities. Dubrovnik President Hotel has an attractive indoor fresh water swimming pool with terrace (deck-chairs and parasols are available for use). The Mediterranean-styled wellness centre offers finnish sauna, infrared sauna, turkish bath, kneipp foot bath, whirlpool, cardio-gym, two relaxation rooms and relax garden. Facilities in and around the hotel provide endless opportunities to enjoy an active vacation. Sport options in the hotel include aerobics, morning gymanstics and cardio-gym. A peaceful location makes the Valamar Dubrovnik President extremely suited for business conferences and events. Bright natural light, WiFi internet connection, flexible seating arrangements and modern meeting rooms and conference hall provide a perfect professional environment. Outdoor terraces with stunning sea views create an ideal environment for gala banquets and other formal events. Hotel Valamar Dubrovnik President can be easily reached from Dubrovnik airport. You should take the airport shuttle bus to Pile Gate. From there take city bus no.5 or bus no.6 and get off at last stop. Hotel is located only a few steps from it. If you like more comfort prebook a private car transfer from the airport to the hotel. if arriving by car, hotel has it's own private parking space.